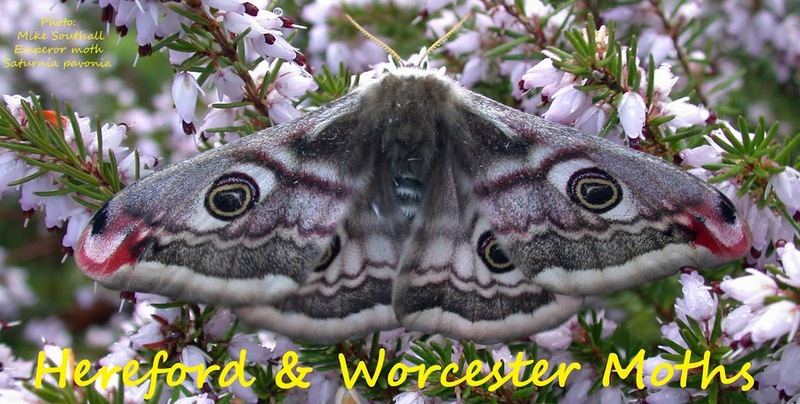 Hereford and Worcester Moths: Fond of bananas? During my daily dog walking sessions over at Burlish Top, I was lucky to net the gorse-loving micro Grapholita internana (hence title of post!). This is the first I have seen in the county although it must be present at other sites like Devil's Spittleful and Hartlebury Common. The only other one I have seen was one caught at Kinver Edge by Darren Taylor several years ago. Also at Burlish Top yesterday evening there were 3 or 4 male Emperor Moths whizzing around adjacent to the new pipeline development. Another micro-Spuleria flavicaput-was netted from Hawthorn in Hop Pole Lane, Wyre Forest yesterday morning. This is the first I have recorded in this vicinity. Here's hoping for more goodies in the net over the next few warm days!